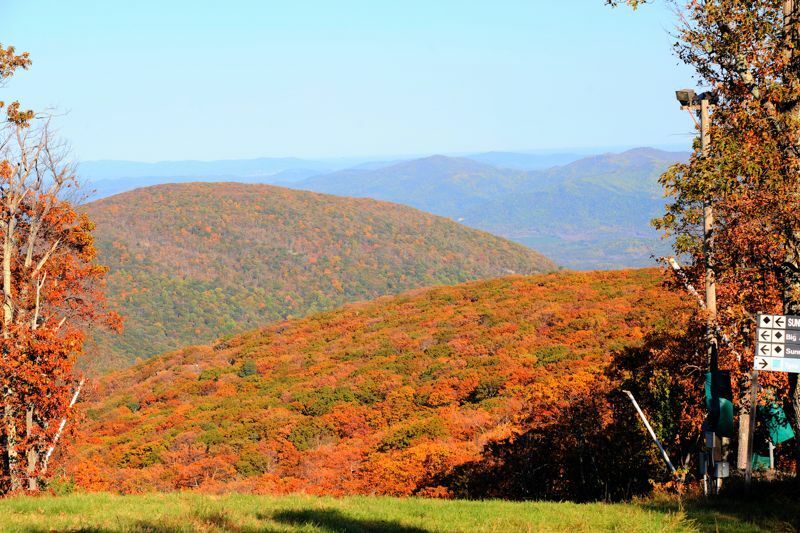 Photo By NCL Mountain Photographer Paul Purpura : This view from Wintergreen Resort looking down one of the slopes and at other mountains, shows the fall colors are nearing peak in Nelson County, Virginia. Though we’ve yet to see a killing frost here in Nelson County so far, the beautiful fall colors are nearing peak in the mountains at places like Wintergreen Resort, Love and Montebello. NCL Mountain Photographer Paul Purpura grabbed the shot above this past weekend up around 3600 feet at the resort. Between now and this coming weekend major weather changes are on the way before Tough Mudder begins on Saturday and Sunday. As Tommy talks about in his Tough Mudder Weathercast, a large storm system will work its way into the Mid-Atlantic area Tuesday night and Wednesday bringing the potential of heavy rains and gusty winds, especially behind the system as it moves off to the NE US on Thursday. Much cooler weather arrives on Thursday through the weekend. Nights will be in the 30’s. Here’s a neat link to the VA Dept of Forestry to see the peak color map across the state. Though it appears Nelson is a bit ahead in the mountains.